Win up to £100,000 playing MONOPOLY Bonus online, an Instant Win game of chance from The National Lottery. 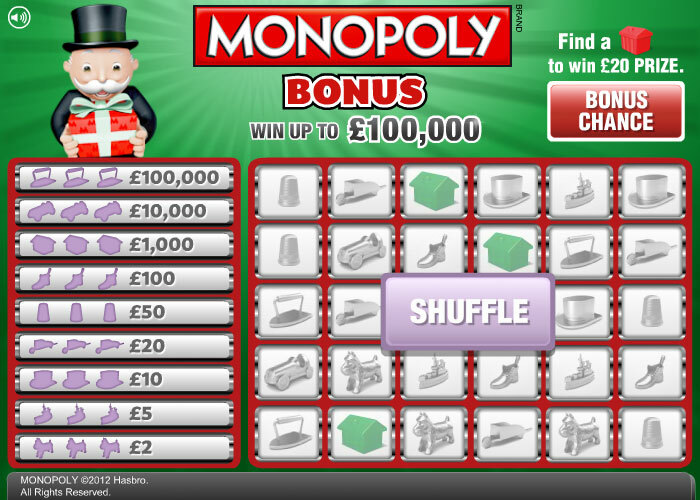 Play	MONOPOLY Bonus online for just £2.00 per game, it's as simple as 'clicking' your way to a possible £100,000 Instant Win top prize. All you have to do is click 'Shuffle' to scramble the tiles, then choose 14 tiles and click to reveal the MONOPOLY symbols behind. Expose three (3) identically matching symbols to win the prize from the list shown in the table below - you could win up to £100,000! Extra feature! Just click the 'Bonus Chance' at any time after you have 'Shuffled' the tiles and you might reveal a red MONOPOLY hotel worth a £20 win! Overall you have a 1 in 3.9 overall chance of winning a Prize every time you play and The National Lottery expect the Prize Payout Percentage for this game to be 71.78%. Only one Prize Amount can be won for every Play as listed in the table above.